The blogger's table at Chef at Large was invited to sample the Srilankan food fest at Double Tree, Hilton Mayur Vihar. The festival is up till September 23rd and you can consider going there if you like south Indian-Srilankan food.Did I recommend too early? Read on to know more. 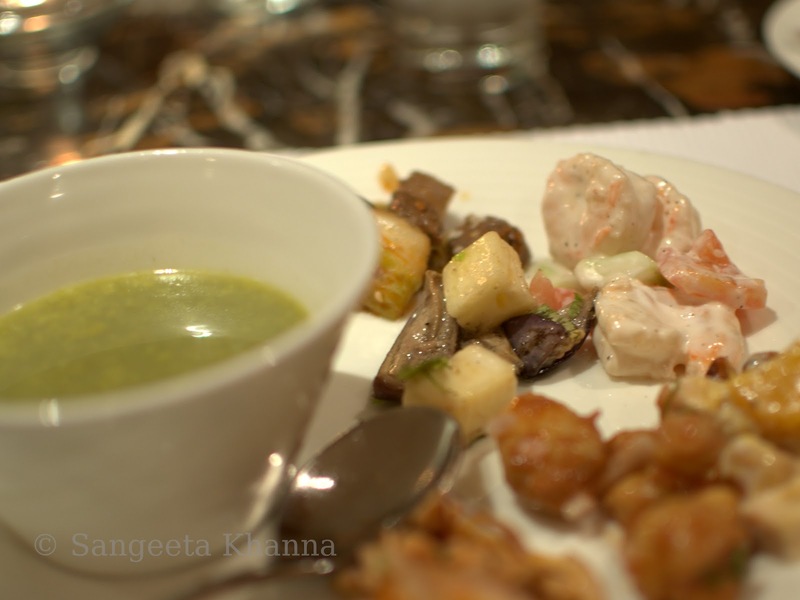 For someone who had never tasted any Srilankan food, it was a pleasant invitation and I lapped up happily. 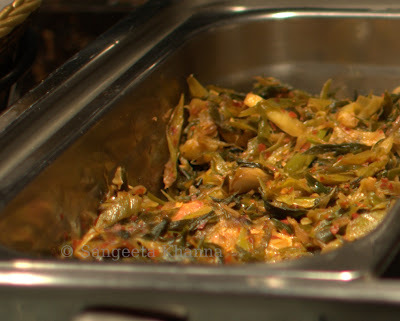 My presumption was that it will be like Tamil and Kerala food that I have tasted till now and I was right. Coconut and spices and most importantly the chilly heat is one of my favorite jamboree of flavors. I got all of it here. The above picture is of the Biryani station, the one I didn't try as I normally don't eat rice for dinner, especially when I have to taste a lot of things in one go. There was a live station for making Prawn fries in spicy Srilankan batter but I didn't have the heart to go for that. Ruchira got some Kothu paratha made and we all had a bite of it. It was nicely done, well balanced scramble of all things yummy...But that was after I had had my salads. 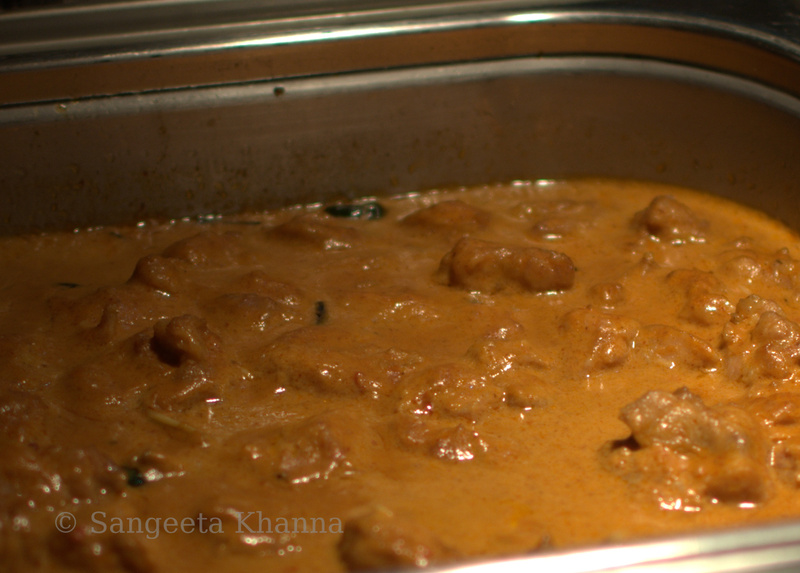 I started with a nice soup of Cashew nuts and curry patta and that was really nice. Creamy and a hint of the herb and very mildly hot. On the side you can see a few salads I picked up, all were pretty good, could make a standalone meal for me. This salad caught my eye first. 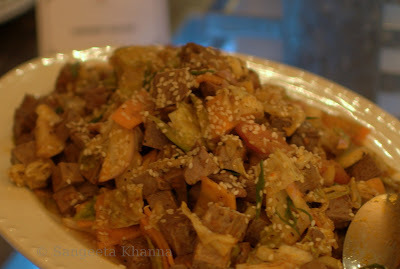 A pineapple and shallow fried Aubergine salad. a very unusual combination but it tasted nice. More because I love both the components of the salad and they were not mixed to kill each other. 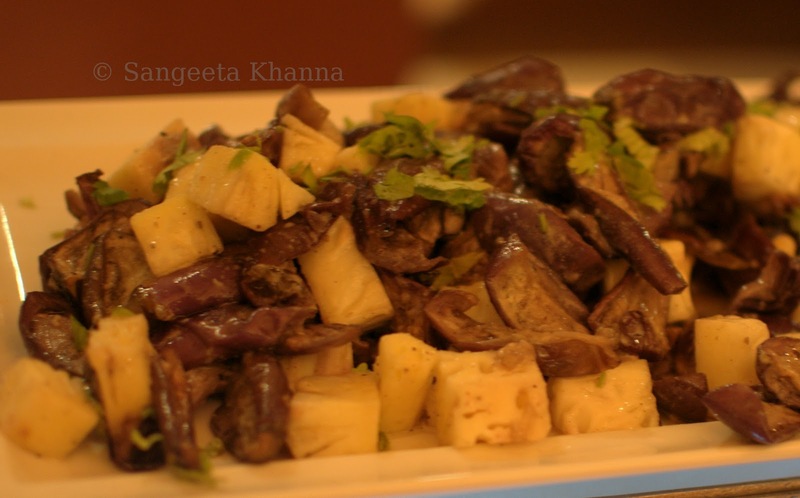 Simple seasoning of pepper, cumin and coriander leaves in the aubergine and the pineapple cubes were just tossed with it. 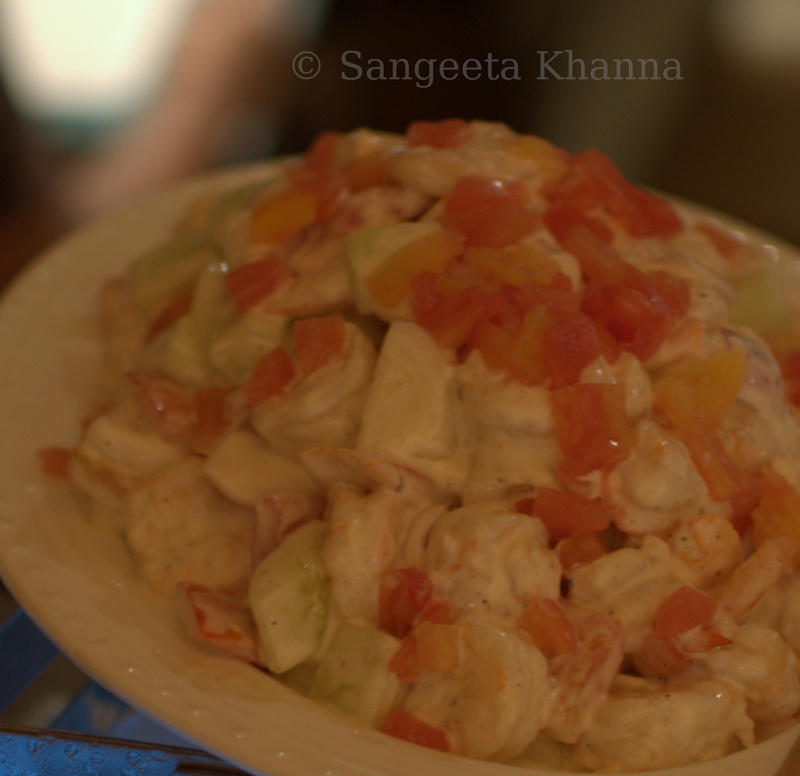 Another salad was a shrimp, tomatoes and cucumbers tossed up in Mayonaise. Simply done delicate flavors. This was definitely not Srilankan, there were many more dishes of continental origin on the buffet, so one can pick anything one likes..
Tuna and chilly onion stir fried salad was another very good salad that I had. Balance on flavors again. 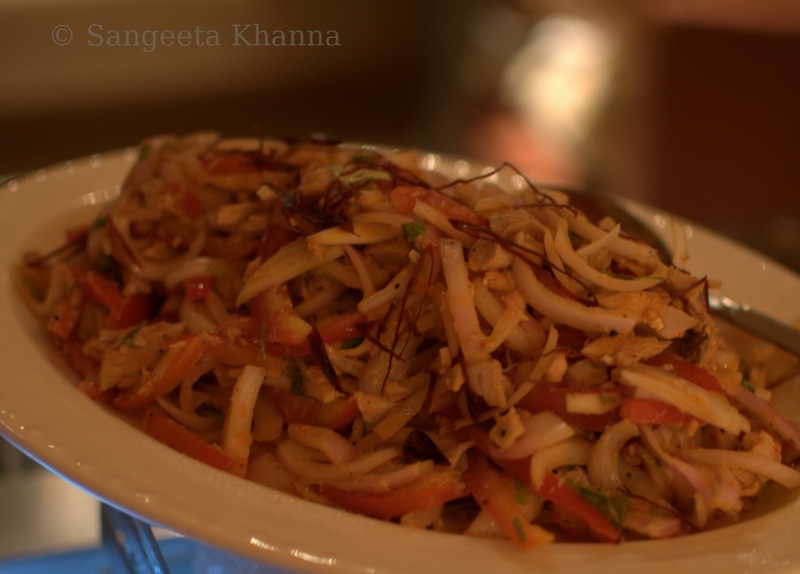 There were may more salads on the display and you could choose whatever suits your taste.This one, a Ham and vegetables was a tempered salad that was more of an Anglo-Indian-Srilakan thing. Interesting, but not my taste. 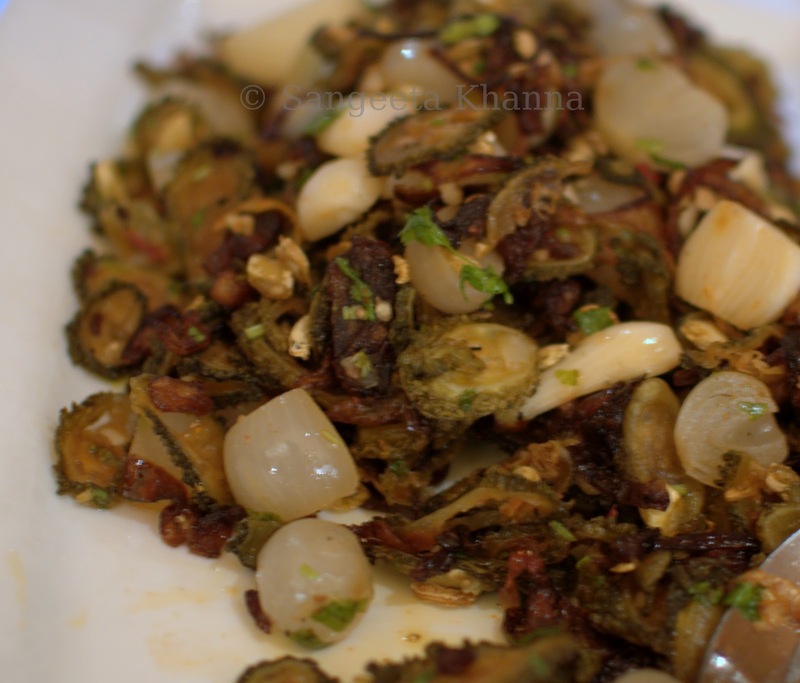 What I liked the most was this Bitter gourd and shallots stir fried salad ... very flavorful, crisp, thin slices of bitter gourd and soft cooked shallots. Mild hot and a little sour. Sweetness of baby onions balancing the act.Yum. Now you know how much a sucker for salads I am. Can't stop myself once I spot a few good ones.There was this Potato and Chickpea salad tossed up chaat style. A crowd pleaser this one. Loved it, couldn't enjoy as I had to keep some space for the mains too. Spotted this Acharu counter and just had a bit of everything. These are hot pickles with a sweet tinge, especially the onion one. 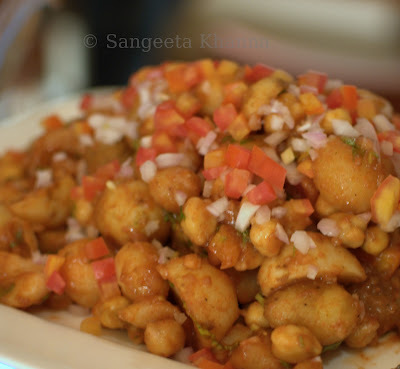 Very tasty and very different from what we have in North India. 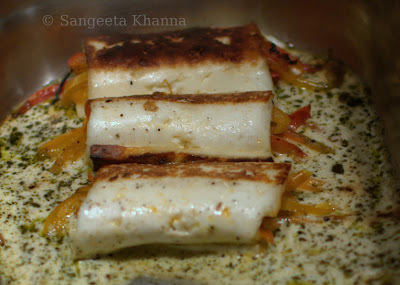 This Pol roti was very new for me and made me curious. Then disappointed me. It was a disaster. Hard cakey rice roti base was just not something you would like to dig your teeth into. On the right is a fried Fish cake balls. That was good if not extraordinary. 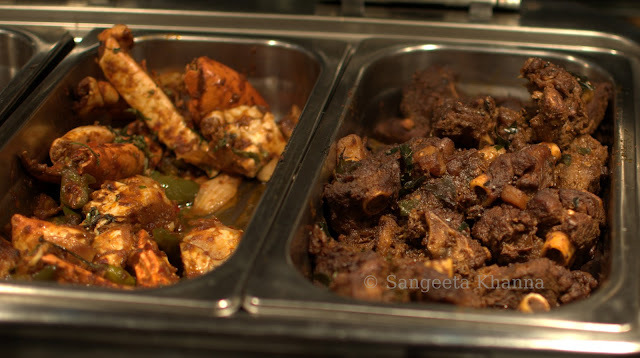 For the mains, there was this Mutton rara and Deviled chicken. I was not interested in Mutton rara but this deviled chicken was tried, it was flavorful but I was expecting a softer juicier chicken. Good flavors though. 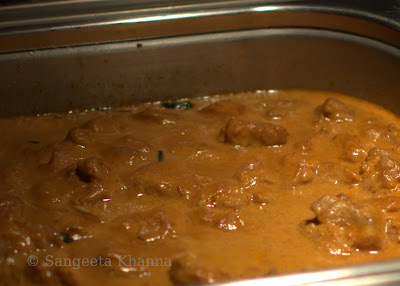 Another of my try was this chicken curry in a spicy coconut milk based gravy. 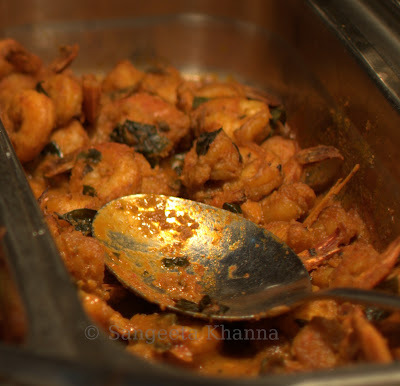 A must try, although you would be reminded of the Kerala stew without the vegetables. Still a flavorful curry to enjoy. I liked a vegetarian fare quite a lot. Most of the places ignore the vegetarians but I loved the way every veggie dish was great tasting and balanced in flavors. Like this Leeks stir fry was looking mish-mash but I had a feeling it would taste good. And It did. My kind of a healthy subzi.There was some scalloped potato and an Okra fry but I had no scope for those. They looked promising too. And this cashew curry. 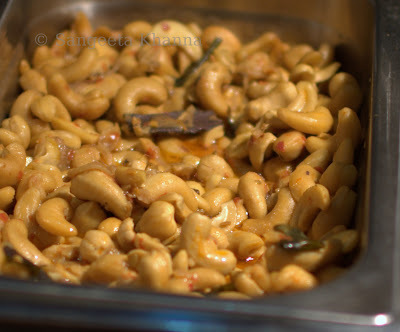 I love Cashew and wanted to try. It was nice, but nothing special. Soaked Cashew, some coconut milk probably but nothing standing out. Plain. This Brinjal Moju was very very tasty too. something I would try in my kitchen soon. 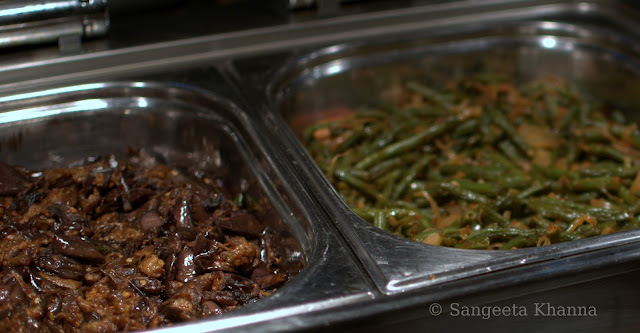 Those green beans on the right were nice too, spicy and just well cooked, preserving the crunch. Sushmita was happy being a vegetarian as there are few places that serve nice vegetarian food on buffets like this. I loved the vegetarian fair equally. For non vegetarians they had a good variety too. These Chilly Crabs on the left were to die for. Only if you could break the claws with your knife. No Crab cutter was provided and many had a tough time breaking it. I am skilled with knife and got my hands dirty sucking the meat out of those claws. That tasty. On the right is the Mutton battilco. Not much of my liking. Spice lovers could try, A bit too dry for my liking. Avoidable. There were better options around. I liked this Prawns stir fry as well. Hot, a little tangy and curry patta rich. Cooked well, plump and soft not at all rubbery. 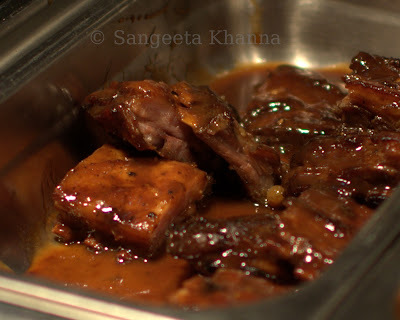 Most of us, Charis ,Parul, Sudipta and Arvind loved this BBQ Pork ribs as well. I didn't want anything this heavy so steered clear of it. The hoppers were tried and enjoyed and a very interesting dried fish fry that I liked but couldn't click a picture as I spotted it late. Don't miss that. 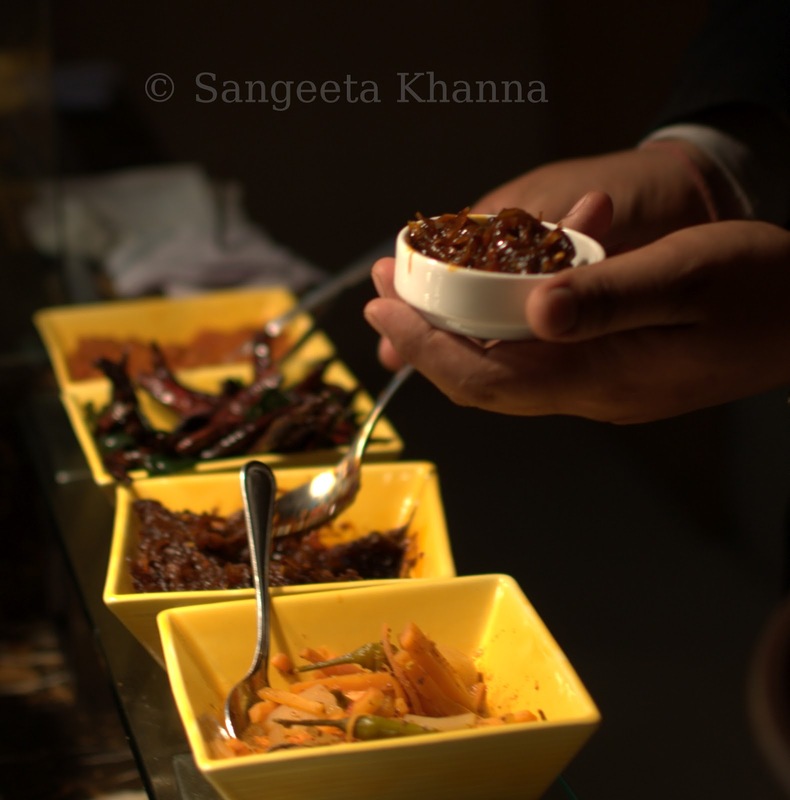 The Acahru, the Chilly Crab, the dry fish fry, the Brinjal Moju, the bitter gourd stir fry, the cashew soup, the BBQ pork ribs and almost all the vegetarian stuff is worth spending your money for. For desserts there was not much choice for Srilankan taste, just the Kalu Dodol which I found too sweet for my taste. Other desserts like Panacottas, Brownies and all were not worth trying for me. Some more of Srilanka could have been better for me. Not complaining as you can always ignore a few disasters when you have numerous yummy dishes to dig your teeth into. 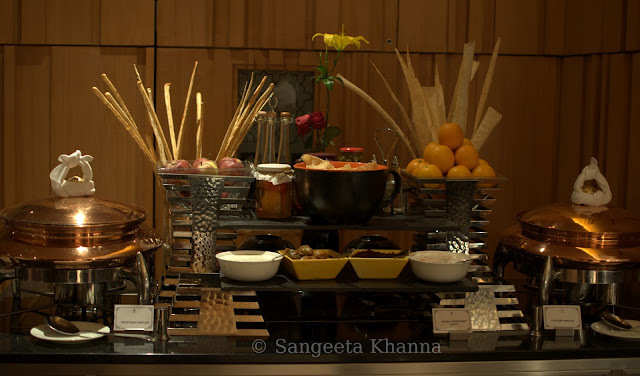 The buffet costs INR1500 per person without alcohol. Venue is Cafe on Three, Double Tree, Hilton Mayur Vihar, New Delhi. Timing of the buffet is 7 pm to 11 pm. I would suggest Delhi foodies to try this Srilankan buffet if they like south Indian food.